Ann Arbor planning commission meeting (April 15, 2014): A revised version of renovations and expansion at 515 Oxford – a house originally designed by architect George Brigham in 1940 – will move to the city council for approval, following action by the city’s planning commissioners. At a meeting with a third of the nine-member commission absent, the group voted unanimously to grant a special exception use that will allow the building to be used by the Delta Gamma sorority. It will be limited to 20 residents, and will be used as an annex to the main sorority house down the street. The commission also recommended approval of a “planned project” site plan, which will now be forwarded to city council for consideration. Unlike a preliminary version of the project – when the architect had been unaware of the building’s historical significance – the current proposal works to preserve the integrity of the original design. The new design keeps the existing structure, but nearly doubles the square footage with an addition in the back. During deliberations, some commissioners mentioned the relatively large amount of correspondence they’d received about this project, including letters from several preservation groups – a2modern, Detroit Area Art Deco Society, the Michigan State Historic Preservation Board, and the Washtenaw County Historic District Commission. The house is not located in an historic district, and is not protected by any other historic designation. City planner Jill Thacher, who serves as support staff for the city’s historic district commission, said she appreciated that the renovations are sensitive to the history of the structure, keeping the front design in tact and minimizing the overall visual impact of the rear addition. This was the only major agenda item in a relatively brief meeting that lasted about an hour. The commission’s next regular meeting is on May 6 and will be held at the county administration building at 220 N. Main. The second floor of city hall, where the commission’s meetings are typically held, will be used by election staff for the May 6 transit millage vote. Before then, the commission will hold a retreat on April 29 starting at 3 p.m. at the NEW Center, 1100 N. Main. It will likely last until about 8:30 p.m. and will include a walking tour of the area. 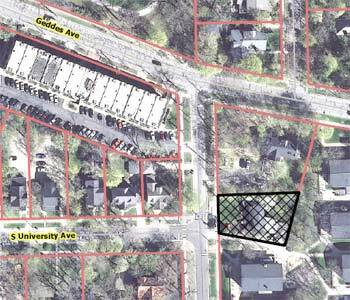 Ann Arbor planning commissioners acted on two requests related to converting a house at 515 Oxford for use as an annex to the Delta Gamma sorority. First, commissioners were asked to grant a special exception use to allow the house to be used as a sorority. The main sorority house is located nearby at 626 Oxford. In a separate item, commissioners were asked to recommend approval of a “planned project” site plan, conditional on rezoning the site from R4A (multi-family dwelling) to R2B (two-family dwelling and student housing). The rezoning request, which the commission recommended for approval on Jan. 23, 2014, has been forwarded to the city council. According to city planner Jill Thacher, who gave the staff report, the timeline for this project is coordinated so that the site plan will be on the same council agenda as the second reading of the rezoning request. The two-story house at 515 Oxford includes two one-story wings on the building’s north and south sides. It is currently a rental property with three units – a studio apartment, one-bedroom apartment, and four-bedroom apartment – and a maximum occupancy of 8 people. The existing house was designed by George Brigham and built in 1940 as his home and architectural studio. He designed over 40 houses in Ann Arbor, including many in Arbor Hills and Barton Hills between 1936 and 1958. The proposal for a renovation would accommodate a maximum of 20 residents, including a required resident manager. The structure would be expanded, with an addition to be constructed in the back that roughly doubles the building’s square footage – from 3,089 square feet to 6,490 square feet. The renovation would retain the north wing, which doesn’t meet current zoning setback requirements. [The original proposal had called for demolishing that section of the house.] A second story would be added to the south wing, which also encroaches into the required rear setback. The original wood siding would remain on the existing structure, and most of the windows will be replaced with casement windows – similar to those used in the original house. An existing carport in the front would be glassed in and used as the front entry. A trellis structure that was part of the original house will be restored. The site would include four parking spaces – three parallel spaces along the driveway and one in back – and more than 10 bicycle parking spaces. The shared driveway, on University of Michigan property, is used by the house and the adjacent Oxford Housing, a UM complex. Planned projects allow for variations of the city’s area, height and placement requirements, if certain criteria are met. Among those criteria are “preservation of historical or architectural features.” In this case, reduced side and rear setbacks are being requested to allow the original footprint of the Brigham house and studio to be retained to preserve the house’s existing façade. The house is not located in a historic district. The commission received more than a dozen letters and emails about this project. 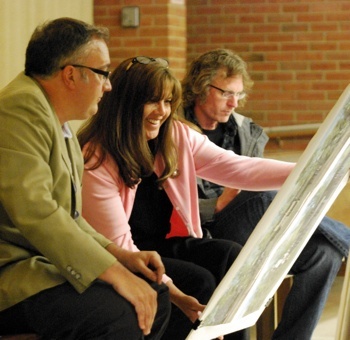 Several communications focused on concerns about compromising the building’s historic integrity – from representatives of the Detroit Area Art Deco Society, the Michigan State Historic Preservation Board, the Washtenaw County Historic District Commission, and a2modern, a group created to highlight mid-century modern architecture in Ann Arbor. Apparently, this property was designed by some distant relative of mine, and now there is a bunch of whining from various relatives about how turning the property into housing for Michigan students is some kind of crime against humanity or some such nonsense. But I have been asked by people who otherwise couldn’t pick me out of a lineup to email you expressing my love of this house I was once dragged to kicking and screaming. You can tear the place down for all I care, and I hope you do, just so I can laugh at the complaints of these idiots. Definitely don’t waste the public’s resources debating the completely legal rezoning of this property any further. The site is owned by Dan Pampreen and is located in Ward 2. The project is estimated to cost about $250,000. The project includes a park contribution of $5,580 that was requested by the city. It will be used for a nearby park – either the Forest Avenue plaza, South University Park, or Burns Park. Thacher reported that the planning staff strongly supports this project. The building isn’t in an historic district and doesn’t have any historic designation. She said she appreciated that the renovations are sensitive to the history of the structure, keeping the front design in tact and minimizing the overall visual impact of the addition. Two people spoke during the project’s public hearing. Al Pass introduced himself as a member of a2modern, but said that his remarks were his own personal comments. 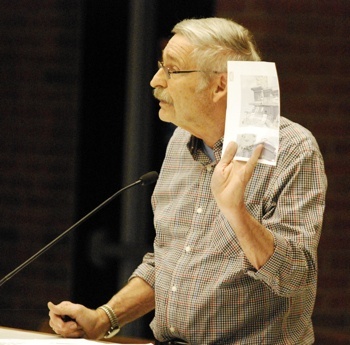 Al Pass, a member of a2modern, spoke during a public hearing on the 515 Oxford project. He clarified with Jill Thacher that the current proposal does not entail demolishing the north wing, as the original proposal did. She said the drawings that Pass had brought with him were from a citizens participation meeting and had been drastically changed since then. Pass said he didn’t have much of a problem with the project as it’s designed now. The house is part of Ann Arbor’s architectural legacy, and he felt that the project tried to accommodate that. Ann Arbor has a unique collection of mid-century modern architecture, he noted. Pass observed that the house isn’t protected under an historic district. Most homes that belong to that era – by Robert Metcalf and other architects – typically are still used as family residences. The 515 Oxford site is one of the exceptions in that regard. 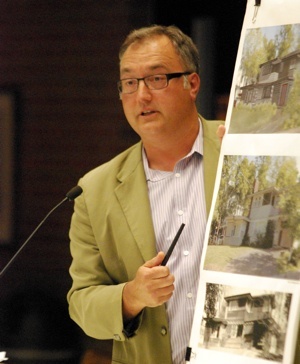 He suspected trying to put these houses into an historic district would meet with considerable opposition. He asked planning commissioners if there was a way that they could work with the city’s historic district commission, a2modern and perhaps the University of Michigan Taubman College of Architecture and Urban Planning – since many of these architects were also faculty members – to find some mechanism to protect these buildings in the future. Robb Burroughs, the project’s architect, told commissioners that after the project was initially submitted to the city, he learned that the house was an “architectural gem” by George Brigham. At the commission’s January meeting, he noted, he had very clearly represented “our major mea culpa” with regards to the original design. The new design is an attempt to retain the vestiges of the house relatively in tact. That’s why, in working with the city planning staff, they decided to pursue a planned project approach, he said, which gives them the latitude to preserve the house. From left: Architect Robb Burroughs, a Delta Gamma representative, and Dan Pampreen, owner of 515 Oxford. He showed images of the current condition of the house, as well as renderings of the proposed design. He highlighted some of the significant elements that are character-defining of the original house, including a trellis that will be replaced, and reconstruction of a “terribly degraded carport.” The carport will be enclosed in a very transparent way, he said, so that it won’t downplay the other elements of the house. He noted that the second floor addition will be slightly higher than the main house. He and another architect who worked on the design didn’t want to “clone” the existing house, in terms of the overall design. So there’s a slight bump up in the southeast rear corner, to create a terracing or scalloping effect. The first floor of the new addition will primarily be gathering space. Many of the existing ceilings in the house are shorter than eight feet, he said. The new addition will have higher ceilings, which also accounts for the higher building height. Viewing the house from the front, the height of the rear addition is minimized because of the grade change in the front. It’s about a six-foot drop from the front to the sidewalk, and an even greater drop to the opposite side of the street. So there’s a significant topographic change, which minimizes the visual impact of the rear addition, he said. Ken Clein confirmed with staff that the sorority will rent the property from the owner. So in the future, Clein said, it might be rented to another tenant. Jill Thacher replied that in R2B zoning, the requested special exception use would allow for a sorority, fraternity or student cooperative. He confirmed that it shouldn’t be used for general student housing, though he noted that it would be hard to enforce that. Sabra Briere noted that the house could in the future be used as a single-family residence or duplex, or boarding house – if a different special exception use were requested and granted. Those are also allowed in R2B, she noted. So while the current special exception use would limit the use to a fraternity, sorority or student cooperative, “there’s still a variety of alternatives,” Briere said. Clein wondered if the renovations require that the home must be made ADA accessible. The project’s architect, Robb Burroughs, replied that because of the amount of square footage that’s being added, there are certain accessibility requirements that must be met. Those issues will be dealt with at the building code level, he said. Clein said he was asking because he didn’t want any surprises later that might change the design dramatically, because of accessibility requirements. Burroughs said he didn’t think that would happen. Wendy Woods clarified with staff that there won’t be a garage. Historically, Thacher explained, a garage was designed in the southeast corner of the building, but at some point it was converted into housing. Burroughs added to the explanation, describing George Brigham as “one of the early landlord converters.” The original drawings for the house, which are archived at the Bentley Historical Library, show that space in the southeast corner as a two-car garage, he reported. But in later plans, it was converted into an occupied space – for Brigham’s studio. So it doesn’t appear that it was ever a garage, he said. Responding to another query from Woods, Burroughs explained that the house was originally a duplex, and the northern wing has its own separate entry. So that’s where a standalone suite will be located for the sorority’s resident manager. There will be an outside entrance to that suite, but also a connection directly into the main house. Woods wondered whether fraternities or student cooperatives also require a resident manager. If not, what happens to that resident manager’s living space? Thacher replied that sororities and fraternities require resident managers, but student co-ops don’t. Thacher said the design for the resident manager’s suite could be easily integrated into the house. She clarified for Woods that if any tenant wanted more than 20 residents there, they’d have to apply for a new special exception use. Kirk Westphal asked if the sign on the structure for “Dan’s Houses” will remain. Speaking from the audience, owner Dan Pampreen indicated that the sign will be removed. Responding to another query from Westphal, Thacher reported that she hasn’t received any feedback from UM about this project. Planning commissioners Paras Parekh and Sabra Briere. Briere noted that the original design was innovative in using differently angled wings, but in the renovations “the wing concept seems to have disappeared.” She understood that it might not fit with the proposed use, but the wings had “really made dynamic building.” She said she was just voicing a little regret about that, adding that she appreciated the restoration. Westphal referred to the correspondence that planning commissioners had received about this project, which included some passionate arguments for preserving the house in its current state – with the hope that it would be reestablished as a single-family residence or some other use that wouldn’t require expansion. He noted that it’s a struggle when a site is located near the university, which affects property values. He asked Thacher to speak about the tension between restoration and upgrades for a different use. Thacher said that one thing weighing heavily on her mind, when looking at the site plan, is the location. It’s on Oxford, where several fraternities and sororities are located. To the north, there’s a rental property. The site is also adjacent to Oxford Housing, a large student housing complex. Nearby on South University, there’s a mix of rental and single-family owner-occupied houses. Angell Elementary School is down the street. Instead, they’ve chose to take the “riskier” planned project approach, she noted, in order to preserve the existing structure. “I do appreciate that they’ve taken that leap,” Thacher said, and that it will preserve the north wing and much of the facade. Given that the building is set back from the street and that it would be difficult to see the addition, Woods didn’t think that the integrity of the building is being damaged by this proposal. She appreciated the fact that the building was being renovated and upgraded. 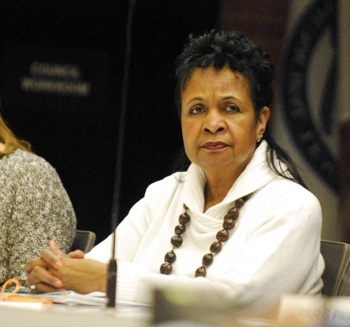 Woods asked for feedback from Diane Giannola, who previously had served on the city’s historic district commission. Giannola replied that she mostly agreed with Thacher’s assessment. The deciding factor for Giannola was whether a building is located in an historic district. “You can’t just protect everything all the time,” she said. Outcome: On two separate votes, the commission voted to grant the special exception use and to recommend approval of the site plan. The site plan will now move to city council for consideration. Every meeting includes several opportunities for communications from planning staff and commissioners, as well as two opportunities for public commentary. Here are some highlights from April 15. 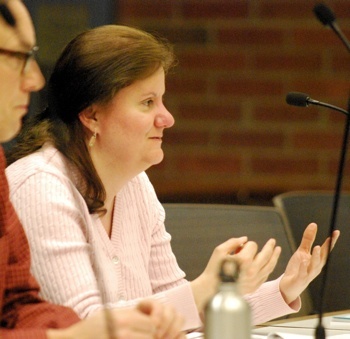 Planning manager Wendy Rampson reminded commissioners that their next meeting, on May 6, will be held at the Washtenaw County boardroom at 220 N. Main. That’s because the second floor of city hall, where meetings are typically held, will be used by election staff. A transit tax is on the ballot for May 6. She also noted that the commission’s retreat is scheduled for April 29 starting at 3 p.m. at the NEW Center, 1100 N. Main. It will likely last until about 8:30 p.m. and will include a walking tour of the area. 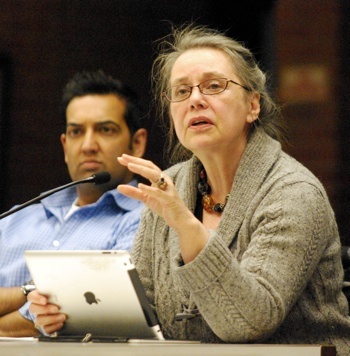 Sabra Briere, who serves as the city council’s representative on the planning commission, reported that the council’s April 7 meeting had included action regarding the Library Lane site. The council increased the size of the area to be designated as a park to about 12,000 square feet, extending across the frontage of South Fifth Avenue, with a northern boundary to be determined. Previously, the council had passed a resolution designating a range of 6,500 to 12,000 square feet, also along South Fifth Avenue. Briere noted that the council had reconsidered a resolution to hire a broker to explore selling development rights to the site, but had again decided to move forward with that process. She expected that at the next council meeting, on April 21, there will be action on determining a public process for that effort. Briere said she’s heard a lot of concern from people who think there’s already been a lot of public process about that site. But she noted that the discussion has always been about whether to have a public space there, “and very little about what it should accomplish for the city.” Some people have advocated for one view or another, she added, but addressing the question of what the site should accomplish for the city hasn’t been approached in a formal way. The meetings are open to the public. 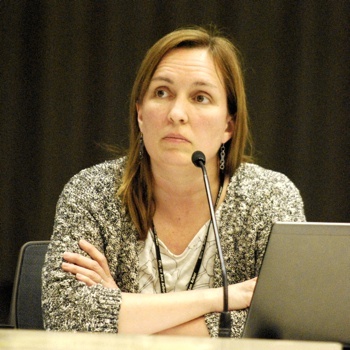 The May 1 meeting runs from 9 a.m. until 1 p.m. Planning manager Wendy Rampson noted that the May 1 meeting will begin as a walking tour, looking at different components of the existing streetscape downtown to determine what works and what doesn’t work. A public forum on this project will be held sometime in late May or early June, she said. Changming Fan spoke about his company, TiniLite World Inc., which he noted has been registered in Ann Arbor since 1996. The firm is the innovator, producer and supplier of new technology called TiniLite, he said. It’s a lighting display using LED lights, cell phones, and wireless Internet. Ann Arbor is a tech town, he said. It has potential, but unfortunately many young people move away. He said he continues to stay because he believes this is the best town. It’s important to develop technology, including TiniLite, to help underserved residents, he said. He hoped planning commissioners could help him. Present: Sabra Briere, Ken Clein, Diane Giannola, Paras Parekh, Kirk Westphal, Wendy Woods. 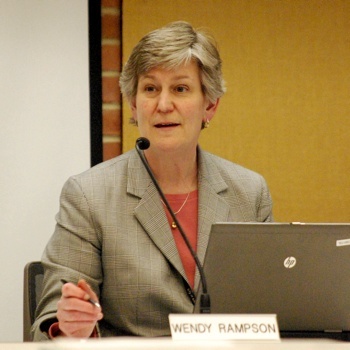 Also: City planning manager Wendy Rampson. Absent: Eleanore Adenekan, Bonnie Bona, Jeremy Peters.